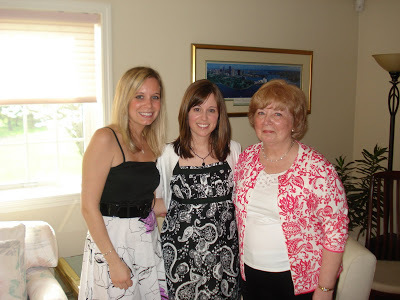 This past Saturday was my sister, Beth’s, wedding shower. She and Adam, my future brother-in-law (yay! 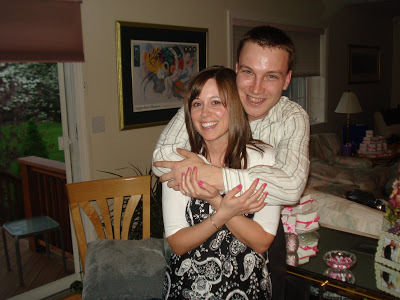 ), are getting married in Boston in September. 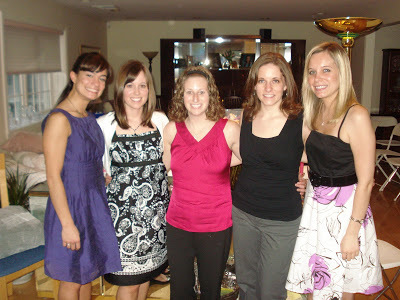 They already had one wedding shower in Chicago, thrown by Adam’s family, but we also wanted to have a Boston-area shower. Along with me, my mom, my aunts (Anne, Judy, Dottie), and bridesmaid Stef all worked super hard to make sure the shower was a success and that Beth would love it. And I think we reached our goal! First come the invitations, of course. 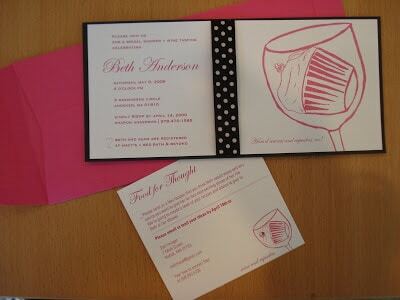 And who better to design invitations than Chels? She did an absolutely amazing job; I can’t even describe how happy we were with these. And how many compliments we got on them. Chels will also be designing Beth and Adam’s wedding invitations. 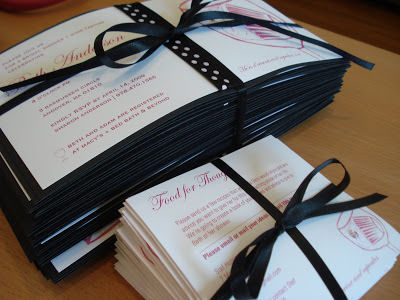 If you ever need invitations, cards, stationary, wedding programs, etc. made, feel free to contact Chels; she always does an awesome job (and I’m going to advertise her because she deserves it)! We decided to theme the shower wine tasting and cupcakes, which we had so much fun with. Of course, wine is always welcome in our family and we wanted to have a nice little tasting. My sister and I also have a special relationship when it comes to cupcakes (who do you think organized all those Chicago cupcake crawls for me? 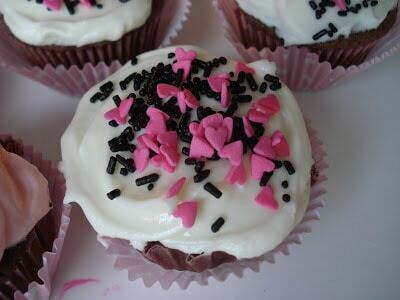 ), so I insisted we tie cupcakes in. 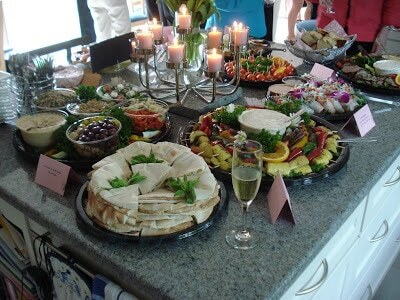 In addition to wine and cupcakes, we had tons of amazing food. 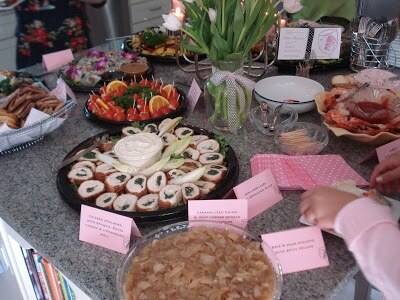 Most of it was catered from Baker’s Best, which I highly recommend to anyone in the Boston-area. We were quite impressed with everything from the beef tenderloin to the Mediterranean platter, to the roasted vegetables, to the pear and brie pockets, to the crab cakes (OK, I’ll stop now). Of course, we also has shrimp from Legal Sea Foods (the best! 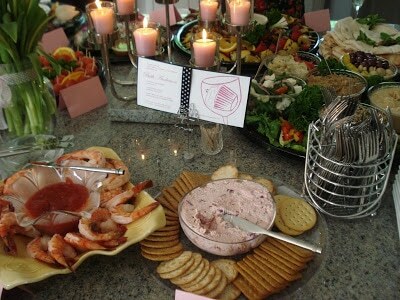 ), I made my mom’s famous caramelized onion and goat cheese dip, and Stef made a salmon mousse. Um yes, there was plenty of food, thanks for asking. Chels also made adorable little place cards for the food that matched the invitations perfectly right down to the rhinestones! We tried to keep everything a secret from Beth, but of course some things leaked out. I still think she was a bit surprised by lots of things and was really happy with the shower! We are not Martha pausing for a photo opp. 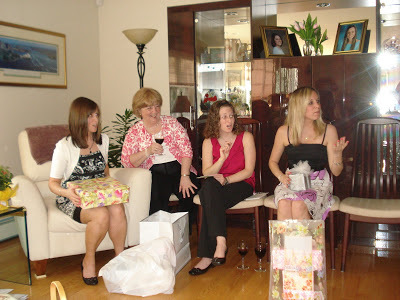 Beth got lots of super nice presents and her bridesmaids did a fabulous job of helping her with them (if I do say so myself). We didn’t want to play any cheesy games at the shower since we knew we would be too busy eating and talking. My family is filled with non-stop talkers who we probably wouldn’t be able to get quiet enough to play a game. I’m allowed to say that because I’m one of them. 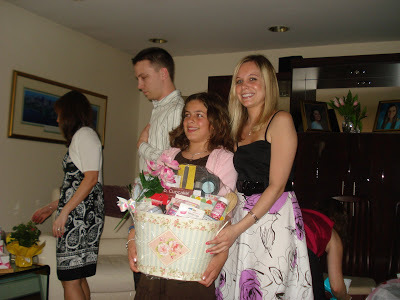 We still wanted to have some sort of prizes at the shower, so we made gift baskets to give away as door prizes. My gift basket was cupcake-themed (obviously), Stef’s was wine-themed, Aunt Judy’s was garden-themed, and Aunt Dottie’s was spa-themed. My cousin, Angela, won my basket, which thrilled me because I’m pretty sure she will enjoy all the cupcake fun more than others would. The desserts were also incredibly plentiful. 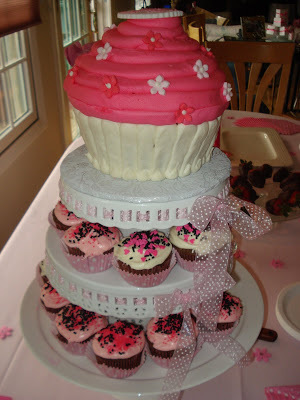 Sara sweetly offered to order a cupcake cake from Boston’s Sweet (we’re all BIG fans of their cupcakes) and it was absolutely beautiful and clearly fit in with the pink theme as well. I LOVE these cakes both because they’re so pretty and because they’re delicious. You didn’t think I was going to throw a shower without making my own cupcakes, did you? To fit in with the theme, I decided to make a red wine cupcake with cream cheese frosting, and while they might sound a bit odd, they were SO good! 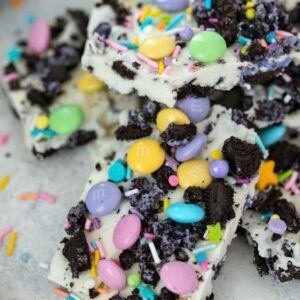 It seemed like people loved them and I can’t wait to make them again. 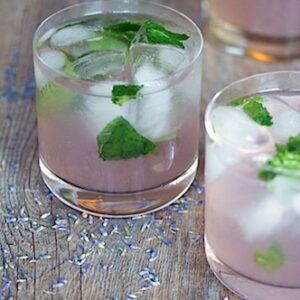 Don’t worry, I’ll be posting the recipe on We are not Martha very soon! 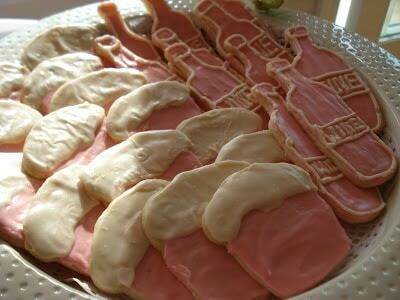 Our good family friend, Maureen, made sugar cookies in the shapes of wine bottles and cupcakes. 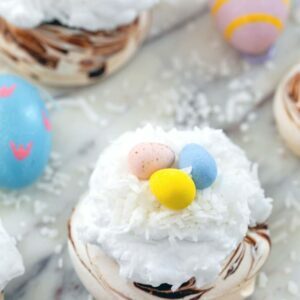 They looked adorable and were absolutely delicious! We also had a dessert bar assortment from Rosie’s Bakery (love them too!). The shower was filled with many of Beth’s favorite people, including my relatives, family friends (some I’ve known forever), my favorite neighbors (who also acted as a “bed and breakfast” for some of my relatives), Beth’s closest friends and bridesmaids, my mom’s work friends, and my own closest friends who have gotten to know Beth over the years. We are not Martha and our friend and regular contributer Sara. My Dad took Adam (the groom-to-be) and our favorite neighbor Jim to Essex, MA, to get fried clams at Farnham’s, but made sure Adam returned in time for the end of the shower. We enjoyed the nice weather for most of the shower and hung out on the deck overlooking the yard that my dad spent hours and hours working on until it was beautiful (I wish we had more pictures of the pretty plants and landscaping he did!). Until the thunderstorms rolled in. But that obviously didn’t stop us from continuing our fun. Lots of guests stayed until almost Midnight mostly chatting and laughing lots. Now that I have all kinds of shower-throwing experience and Chels has got the invites and other stuff down, I’m thinking we should launch our own We are not Martha party planning business. Of course, this shower wouldn’t have been possible without the extremely hard work of my mom, who wanted to make this day as special for Beth as possible. And she did an amazing job!! It was so nice to spend time with all my relatives and I can’t wait to see them again for the wedding. Congrats Beth and Adam, we love you!! ≤ftarrow; how2heroes 1 Year Anniversary Party at Bulthaup! 15 Responses to "Beth’s Wine Tasting and Cupcakes Wedding Shower"
GoodNIGHT- y’all did a BEAUTIFUL job!!! Congrats Beth!! Great theme! I’m sure your sister loved every moment of it. That all looks great susie! i loved every single detail in this post!!! 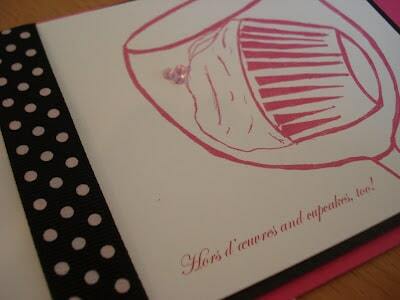 chels great job with the invites and sues, must try one of those wine cupcakes! Obviously, Adam and I LOVE your post of the shower. I can’t believe how you thought every little detail! We really appreciate all the hard work and planning that went into this unforgettable event. So now the question is…. “Want to plan the wedding? ?” – We love you guys! 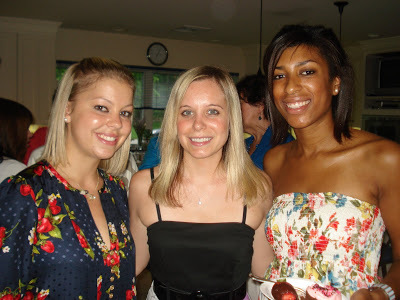 ohmygosh what an adorable bridal shower! seriously you are so creative and everything looks amazing! i love it! such a great time… everything was amazing. food, company, wine- THE BEST! Wow!! The next big celebratory event I have, can I seriously hire you guys as party planners?! Awesome! I love everything you ladies did! 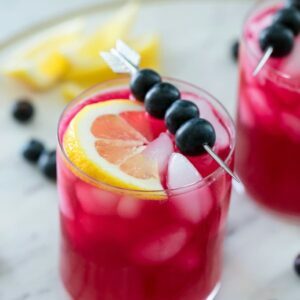 You should definitely consider starting a party planning business. Everything sounds perfect! Looks like a fun event and those invitations are too cute. Great entry!! 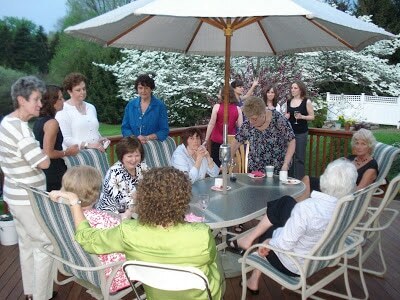 It was wonderful for some of us who could not make the event! And, red wine cupcakes are pretty much my dream come true, I can’t wait for the recipe. everything here looks amazing! I’m reading this at 9am, and I’m now dying for cupcakes. beautiful job with the stationary, chels!! Wow! I’m planning my daughter’s shower and she is getting married in a wine vinyard setting…and since she lived in NYC near “Magnolia’s”, cupcakes are her passion!!! Your ideas are perfect! Thanks for the inspiration!